I’m not sure how many of these ‘the future of Trip’ articles I’ve written over the years, but there have been a few. I like to set out my current thinking of the direction of Trip with some reflections on the past. Business model – our move to a freemium business model last year (most of the site free but a ‘pro’ section for those willing to pay for extra content and functionality) has been a great success. For years we have been concerned about the financial security of Trip and this new approach has allowed us to diversify our income streams and bring the security we craved! New Design – It’s been out for a few weeks now and I’m loving it and the reaction. We rolled out a few new features but it was more cleaning up the interface. It was a major piece of work and it’s great that this particular project has finished. Answer engine – This has been talked about for years and it’ll finally be here shortly. It’ll be a learning system to give answers as well as search results. As all this has been going on as I’ve been reading the very interesting ‘Business for Punks‘ which is an overview of the rise of the Scottish brewery Brewdog. It’s refreshing and has given me the inspiration to write this post. One big factor in their success has been the relationship with their customers, in effect, being their brand ambassadors – helping promote the business and the brand. To a large extent this happens with Trip. We have lots of fans and a great connection and I can always rely on our registered users to help out when I need advice. But one thing that Brewdog have shown is that you cannot do enough customer/user engagement. So, I’m hoping to reflect on better ways of making the Trip users feel part of Trip. Clinicians seeking answers to their clinical questions. Information specialists carrying out literature reviews for systematic reviews, guidelines etc. Academics using the site to plan research. Answer engine – as mentioned above it’ll be rolled out soon. It won’t be perfect but it’s a great start and it’s a learning system so it’ll get better with time. Search algorithm – we’ve followed the same basic algorithm for years, arranging results based on a mixture of word matching (between search term(s) and documents in the Trip index), year of publication and quality of the publisher. This is fine, to a point, but search has moved on massively and we’ve not moved with the times. So, we will be looking to overhaul this. As part of my work in the KConnect I will be working with information retrieval experts to exploit current ‘best practice’. Belief – Underlying the changing has to be a belief that we can be the best. Community – Trip needs to state our aim to be the best and to actually be the best. This will rely on our community of users letting us know when we’re great and when we’re less than great. So, our engagement with users needs to be enhanced – from good to great. 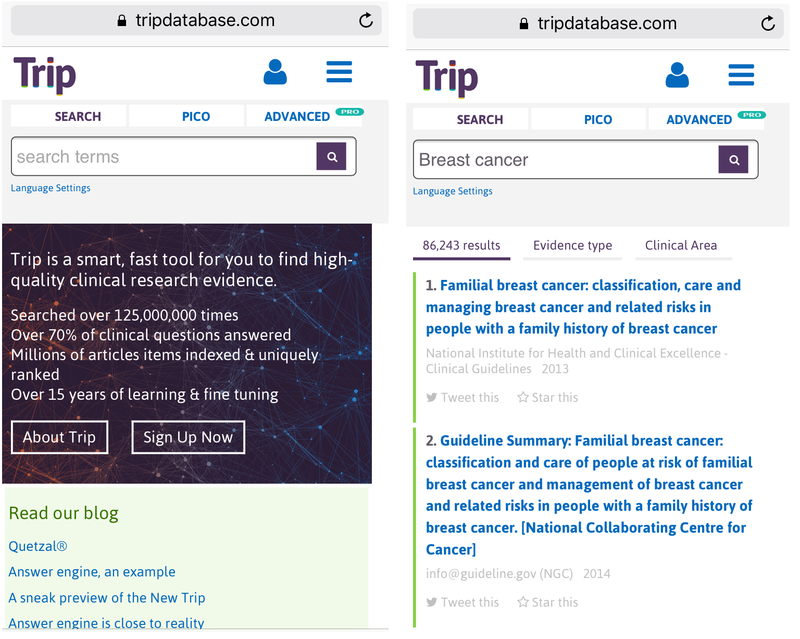 Trip is involved in the extremely interesting KConnect project, via the EU’s Horizon 2020 funding stream. One output of this has been a nice interface to explore our clickstream data. Clickstream data being a record of how people interact with the site eg search terms used, articles viewed etc. This gives us a glimpse of clinical uncertainties, ‘hot topics’, useful sites etc. Below are three images to highlight potential uses, but we know there are more. Imagination is the limitation with this data! Image One – this is a record of searches for breast cancer and a drug. So, which drugs are most popular when used in conjunction with the term breast cancer? In this case, it’s trastuzumab! Image Two – As we record the date and time of the search we can plot search term popularity. 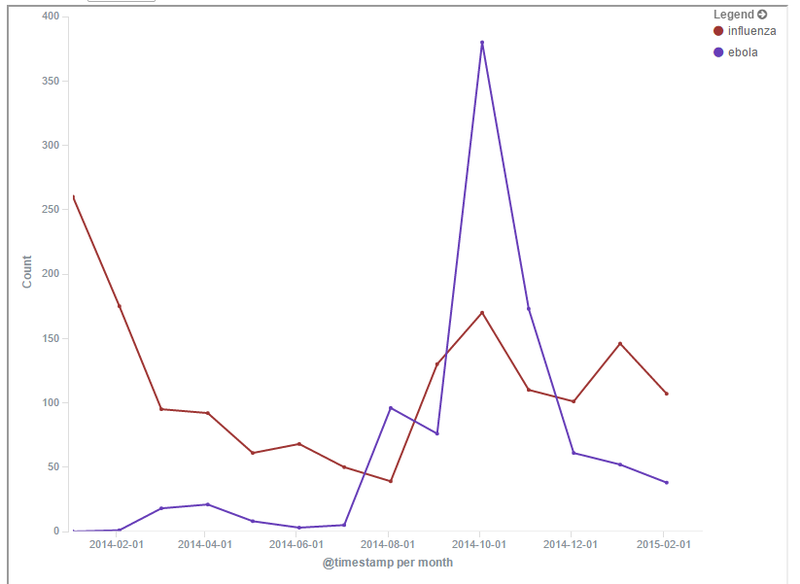 So, you can clearly see a peak of searching for ebola around October last year. 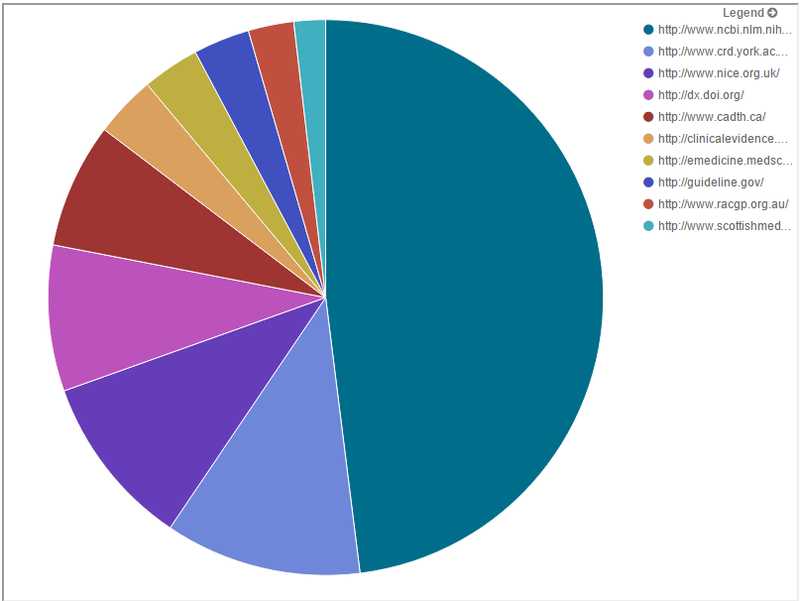 Image Three – for searches which publications have been most visited? Top is PubMed, followed by NHS CRD, then NICE. http://dx.doi&#8230;. refers to Cochrane and the final entry to the top five is CADTH. Better links to full-text. If you are at an institution that subscribes to journals we can use something called a link resolver to link from Trip directly to your institutions full-text (as opposed to the PubMed abstract. This is a powerful feature but does require a link resolver. To find out if your institution has one – ask in the library. Premium membership. 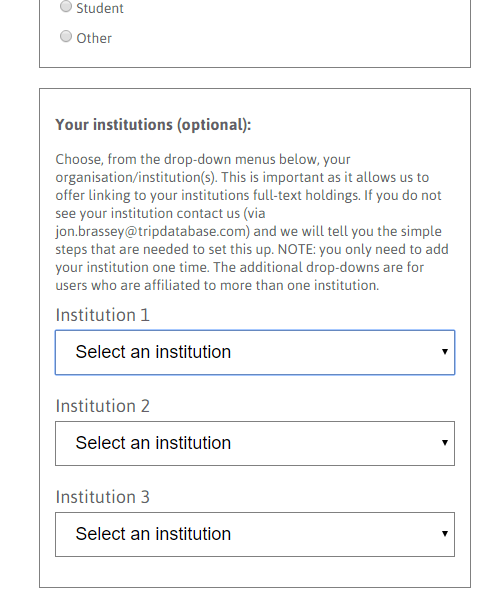 If the institution purchases a premium account it can be used to connect users to the premium content/features. But, to repeat, this can be ignored, it is not essential for your registration. It’s always an exciting time when we release the new site and this time is no different. In fact, I tend to get more excited, as the site gets better and better. So, what’s new? A beautiful new design which has been based on a in-depth analysis of user activity on the site. So, similar functions are better grouped together. Three new extra languages supported in Trip. These allow users to search in their own language and see results in their own language. Feedback has clearly demonstrated that query formulation is the hardest translational activity for non-native English speakers. The ability to search in your own language is a real boost. The new languages are Spanish, Hungarian and Swedish. These sit alongside French, German and Czech. This language support has been made possible by our inclusion in the EU-funded, Horizon 2020, KConnect project. Regulatory guidance which includes NICE, IQWiG, SMC and new content to Trip – FDA and EMA drug evaluations. Ongoing systematic review, via PROSPERO. We have also created a filter for articles on Overdiagnosis. 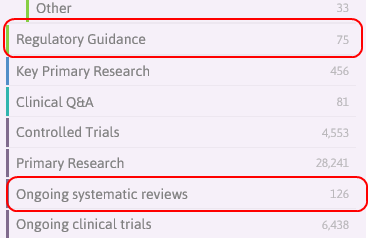 Once you’ve searched you just click the button and we return documents on overdiagnosis and overtreatment. We have noticed, from our analysis of site usage, that the ability to refine initial search results by clinical area is really popular. So, we’ve promoted it to make it more prominent. It’s another way to refine your results so it now sits alongside ‘refine by evidence type’. Simplified the functionality around each article e.g. tweet this, starring etc. Functions such as search history, login are all consistent and grouped together. A further simplification has been the different evidence types. This has meant that patient information is now included in the main search leaving the ‘Pro’ content of Videos and Images available from just above the search results. Creation of an explorer function (again located at the top of the search results) which was previously called the search safety net. At the time of typing this is still being copied over to the new site so won’t be live till later today/tomorrow! Finally, mobile is increasingly important way of users accessing Trip and as part of the redesign we have significantly enhanced our mobile offering.